What a fun-filled action display for your Yard! 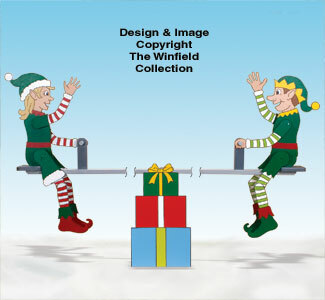 This Special Two Pattern Set includes full-size patterns plus instructions to make both interchangeable Elves and the gift centerpiece along with the Teeter Totter. Requires Teetering Character Parts Kit (#TTKIT) and Teeter Totter Motor and Hardware Kit (#TTKIT4) sold separately below (30" tall, head to toe). 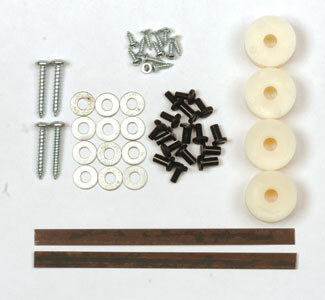 Specialty metal and plastic hardware for the jointed legs and spring arms for two interchangeable characters for our motorized Teeter Totter. 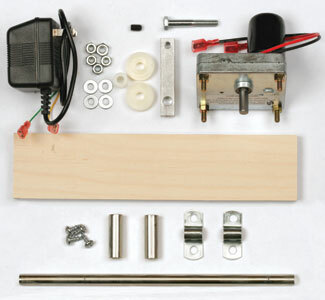 Get our Teeter Totter Motor Kit (#MOT4) and our Teeter Totter Specialty Parts Kit (W1622KIT), both needed to complete one full-size Teeter Totter project, all in one convenient Kit. Includes our hard working 12v DC, 12 rpm gear motor with 40 in. lb. torque, an AC/DV adapter, aluminum shaft link, nylon bushings, miscellaneous hardware, special wood for the teeter totter drive arm and one steel support rod with bearing sleeves and clamps with screws to make one project. use will void the motor warranty.